Getting a decent river boat has been on my wish list for about 15 years. 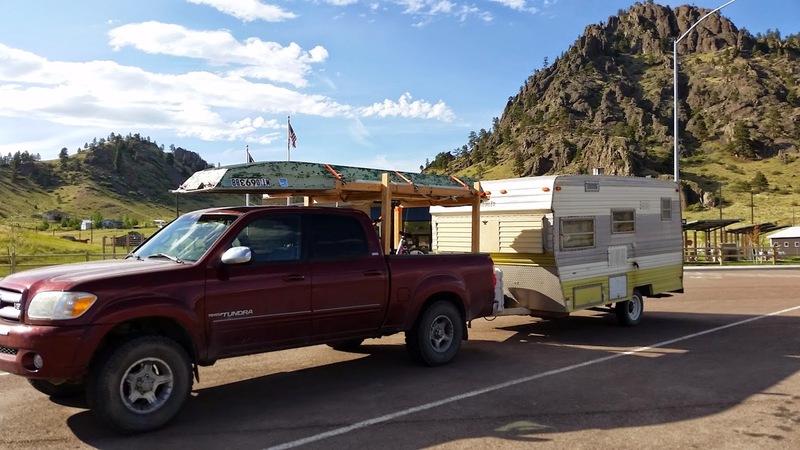 I haven't been without one entirely - back when I was in college I got my hands on a narrow 14-foot aluminum boat that I've hauled from coast to coast in the bed of my old pick up. A classmate came into lab one day and, knowing I intended to get a boat, told me she'd come across one in the woods that morning while chasing her runaway dog. I followed her directions and sure enough, there it was. An old aluminum jon boat situated over an abandoned and overgrown chicken coop. It had apparently served as the roof before the forest swallowed it up with disuse. At the time, an aluminum jon boat that I could carry in the bed of my pickup was exactly what I had in mind. Both for rivers and for a particular lake with no boat ramps that required four wheel drive and creative launching. I tracked down the landowner by going to the courthouse and sifting through land records. Hard to believe I've had that boat since before all that was researchable on the internet. I called the elderly lady up who happened to live a couple counties over and got the answer I was hoping for. "Why sure son, I'd be happy for you to have that." Turns out some previous neighbors had spilled over onto her property in the past with their gardens and such, and so it was a relic of previous trespass anyway. Useless to her. I hauled the boat out of the woods that very day. I have since banged that boat down rivers in five states. I've launched it in alligator-inhabited southern waters across Texas and Florida. I've floated it in northwestern alpine lakes on the reflection of volcanoes. I built a little pad on the blunt bow to receive a transom-mount trolling motor. I reversed the motor's head so that "forward" pulls the boat forward, allowing me to use it like any bow-mount trolling motor or to hover in current with the bow pointed upstream. But it took what might be it's last trip for a while this spring - a float down a prairie tailwater where it boated trout, pike, and walleye. A superior vessel now sits next to it in my driveway. continue my trend of launching anywhere and everywhere, ramp or no ramp. I wanted the boat to be intentionally motorable, yet I wanted a drift boat. I wanted it to be light. I wanted it to be spacious and comfortable (relative to my narrow little 14ft jon boat), but small and nimble enough to tackle tiny waters. I added electrical features such as running/navigation lights, headlights, interior lights, and a 12-volt power port for things like cell phones, a spot light, etc. I had it wired to the transom so that I could hook up my electric motor without cords trailing around the interior of the boat. I added an onboard charger for plug-in-and-go battery charging. I had chine guards installed so I could strike rocks with a little more peace of mind. I also opted to keep the front deck as open as possible, installing a removable casting brace (rather than a built-in hood style) and a removable pedestal seat (rather than a built-in box seat - strapped down Yeti coolers with seats mounted in the lids are also an option). The open front can be used to hold a large cooler, to pack camping gear, or to carry hunting gear and game. When floating solo I pull out the seat and casting brace and cast from the fully open deck while anchored, with as much space as if standing on the carpeted bow of a bass boat. And all of this was thousands of dollars cheaper than any other brand I researched - and that would have been with none of my electrical upgrades, if they were even available at all. 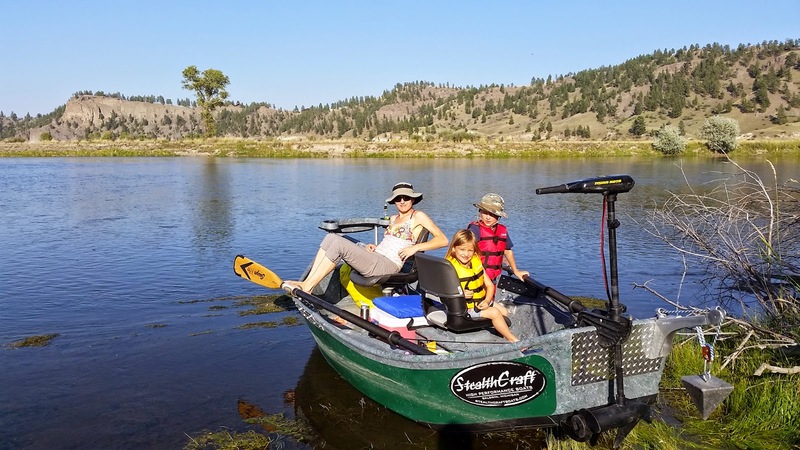 I wound up with an affordable, highly functional, and an extremely versatile boat I can use day or night, motor or no motor. 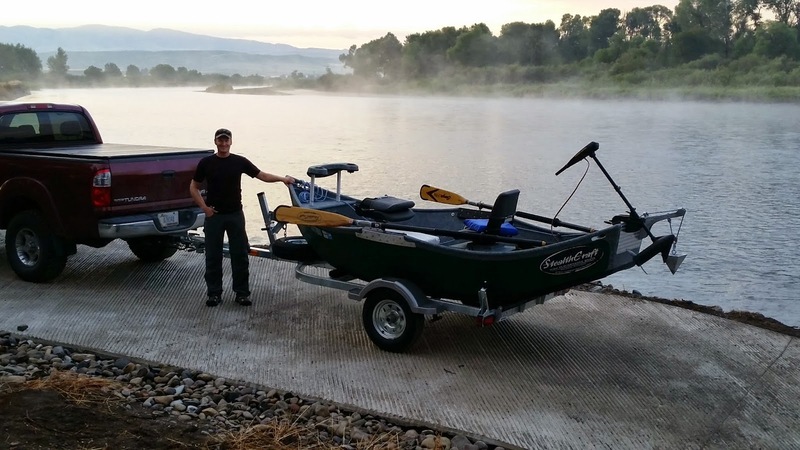 It has three areas of covered storage (even with me opting out of a built-in box seat for the bow angler), a tackle tray that runs half the length of the boat, and racks to hold four rods underneath the tray. The interior of the boat is fully open, front to back. A guy can walk circles around the boat when hooked up. I was fortunate enough to get to make the trip from Montana to Michigan to pick it up. It was nice to meet and visit with Mike Batcke (the owner of the company) and the crew that had built the boat. Even took a little float down a piece of the famous Pere Marquette, the first river in America to have brown trout. 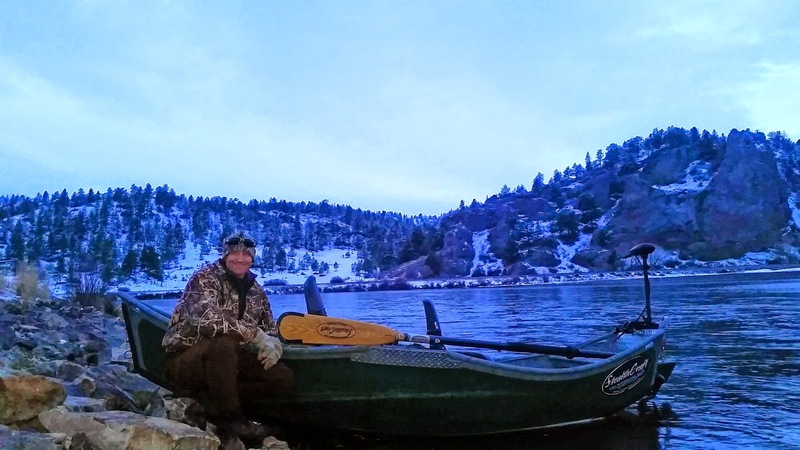 If you pick your boat up in person, Mike will treat you right - a night in his lodge and trip down the river. You might even get a shirt and hat or two. 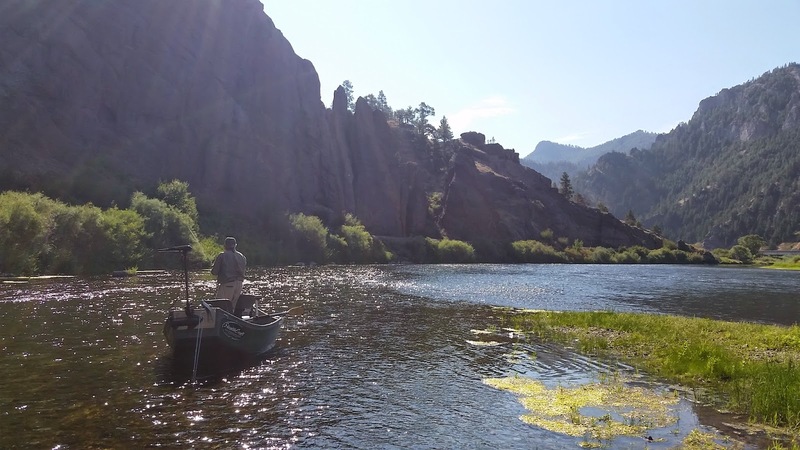 I was impressed with the area and its rivers, and if ever possible, I will return for some winter steelhead fishing with Steve Cornetet, Batcke's Baldwin Creek Lodge's head guide. The evening Steve took me down the Pere Marquette I did land my first Michigan brown and failed to bring a much nicer one to the net, but none of the salmon or steelhead runs from the Great Lakes were in the system at the time. 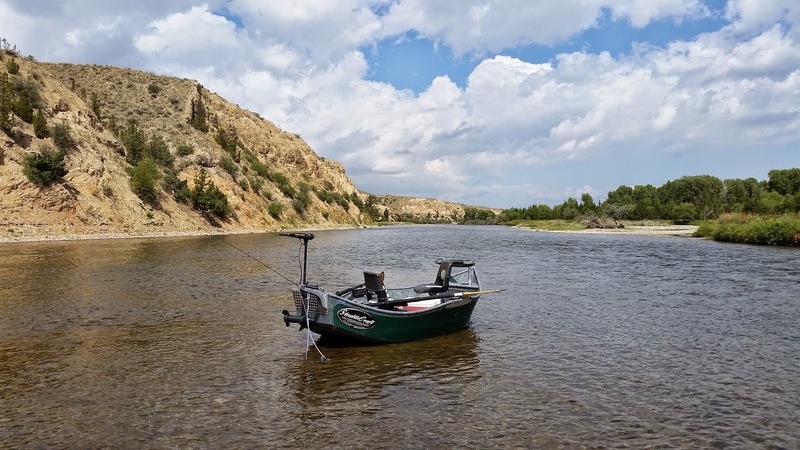 My boat's first trip on water was a walleye float on the upper Missouri River - the stretch above the lakes and famous blue ribbon tailwater sections. I was pleased that I could easily motor the boat just as I had intended - "rowing" with my electric motor and fishing at the same time instead of being confined to the oars for mobility. The anchor system is easily reached from either the rower's seat or from immediately behind it. I can have one hand on the tiller and one hand on the anchor rope. This is extremely handy for pulling a sticky anchor, or for dropping anchor exactly where I want to be. 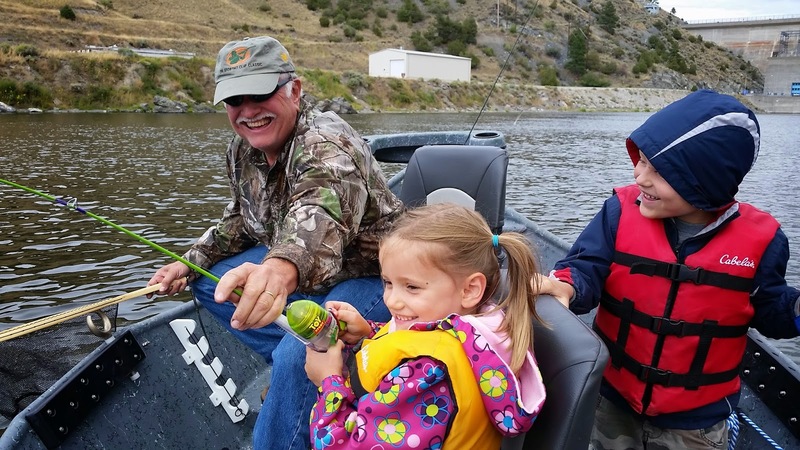 Subsequent trips have taken place on various sections of the famous tailwater below Holter Dam. The Missouri is my "home" water at this point in my life, and with the boat being so new, it hasn't been launched in another stream yet. 2015 will change that. days we fished. To buy the boat I sold a pickup truck I'd had for 17 years. The first vehicle I owned. All the things I'd done in that truck! All the places it had carried my old aluminum jon boat to! And now its legacy will continue in the form of a fine boat. One that both my kids have already caught fish from, and will likely continue to for much of their lives. I've floated it in stellar Montana summer weather. I've floated in an all day down-pour where twice I had to drag the boat on land and pull the drain plugs. I've floated with snow blowing sideways. I've broken ice out of the floor with a shovel. Its been a good boat, all six months of its young life. I admit I row it infrequently, but when I row, it responds well. Spins on a dime. Tracks nicely. There are five oarlock positions and an adjustable (and removable) foot brace on the floor. Even at just 12 feet it carries three folks fine. I've spent my time with a fisherman on each end while I row and I've also stood in the stern at the electric motor, while all three folks fish. The boat is absolutely ideal for two fisherman, and comfortable enough for three that I don't hesitate when the need arises. Mostly I stand by the transom and guide my drift with the tiller of my trolling motor, hopping onto the oars whenever the water is too shallow for the motor. 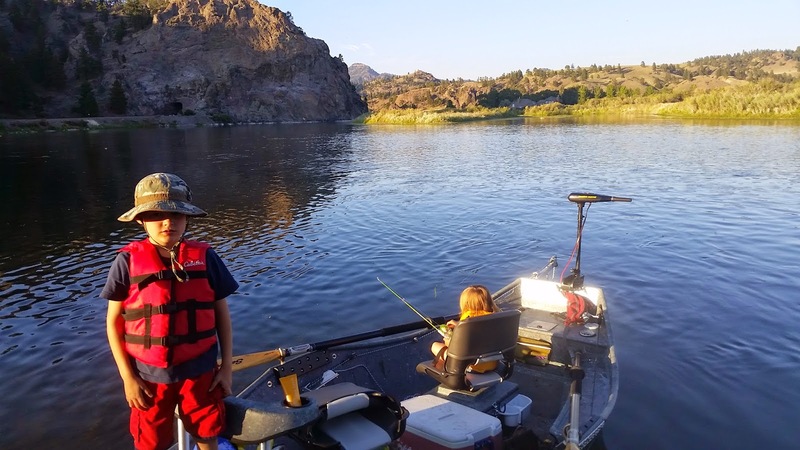 Of course that will change on swifter rivers, but in flow where it's possible, using the reversed trolling motor is working as I intended - just as I used to do on my jon boat for all those years, but in much more comfort and functionality. In future trips I'll be sticking one of my outboards on it and puttering up portions of the Missouri and other slower rivers where ramps are infrequent. I won't be able to cruise like a jet boat, but I'll likely be one of the only drift boats on some of those stretches. I'm sure it will see use in lakes as well. What brand and model is the electric motor you are using (thrust and shaft length) and where is the battery located? The motor I have is a Minn Kota Maxxum 55 - 55lbs thrust, 12 volt battery. From handle to prop center it measures 42 inches. I do not recall the quoted shaft length, but the length of exposed bare shaft is 33 inches. I have owned the motor for about 12 years, and it appears that the Maxxum model line is now only available in bow mount. After viewing the Minn Kota website, it looks like the Endura Max 55 is the equivalent to what I'm using - infinitely variable speed, battery meter, etc. The battery is located in the rower's box in my boat. If you chose to have a permanent box seat installed in the bow, Stealthcraft would locate the batter there. Thanks for your quick response. I'm interested in purchasing a 12' MiniFly - How much did you pay for your boat? Ed - feel free to reach me at j.bryanallison@gmail.com. We can discuss specifics there. I purchased my boat from the 2014 price list, and I added upgrades. I do not know if there will be any changes to the 2015 quotes, but no doubt you'll still be able to build a heck of a boat and come in way under the base price of other companies in the industry - and have features they don't offer to begin with. Hey Brian- I have the same boat and loving it. The 12volt under the rowers seat, are you running wires across the floor or did you route them a better way? Brian - I had Mike and crew wire it when the boat was built. The wires are internal. There is one rib in the floor connecting the rower’s seat to the side wall (for the wires to pass through, including the lights, etc). Mike really encouraged me to put the battery in a front box seat and eliminate the need for that rib, but I wanted a pedestal seat and no box up front. I can send pics if it helps you do some after-the-fact wiring (run a tube out the bottom of your box?). I have a plug in the seat at the transom to connect the motor to. No exposed wires. 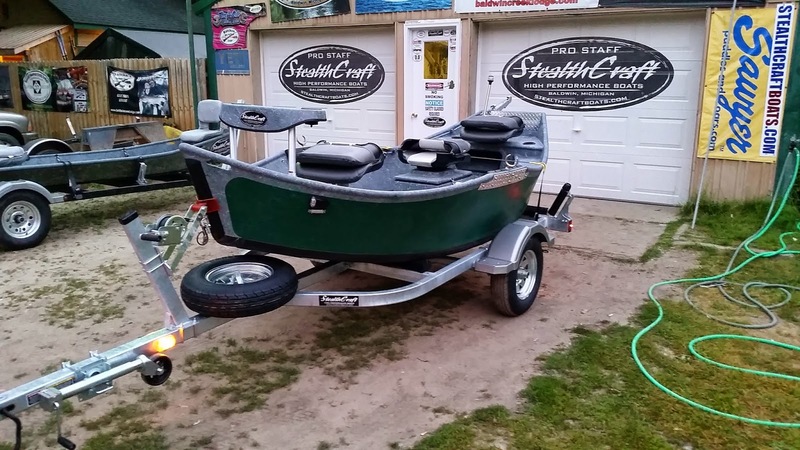 Nice boat, thinking of getting one also for chasing Smallmouth in the local rivers. How shallow can you float with 3 people ? Bryan , I live outside the Smoky Mtns. also on the TN side. 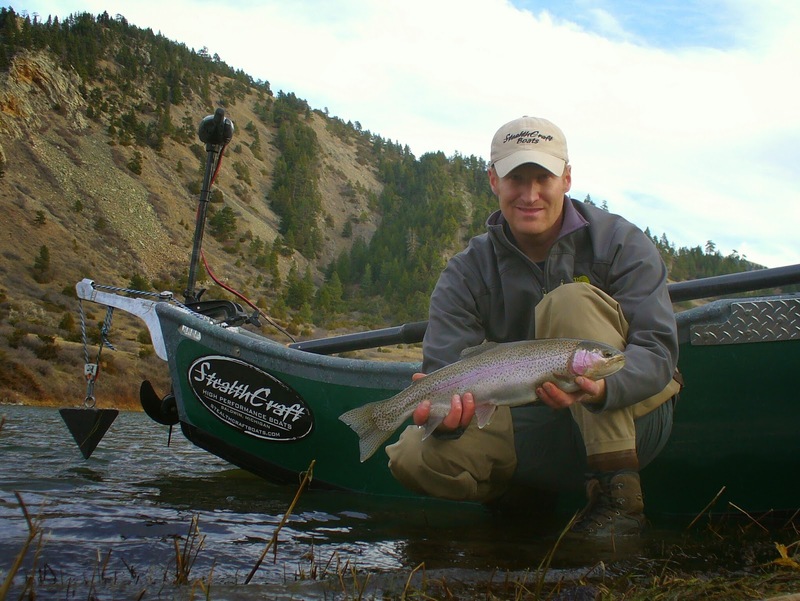 @Troutman - I cannot tell a major difference when loaded heavy, and I've had some big folks on board in the 2+ years since I wrote this article. It obviously rides lower, but we are still talking only a few inches of draft. Mostly only the same obstacles will apply - I have to drag over the same gravel bars either way and in your case, you'll still bump into the same exposed bedrock. It's like an overly wide canoe for draft. Feel free to email me at j.bryanallison@gmail.com with any other questions or discussion.